Galway East Tourism - Conneely\'s B&B in East Galway, West of Ireland.Galway East Tourism - Conneely\'s B&B in East Galway, West of Ireland. A family home just 1km outside the village. Off street parking and separate guest entrance. 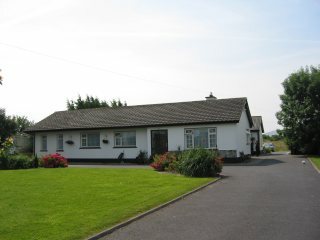 Conneely's Bed and Breakfast Guest House is situated just outside the beautiful coastal village of Kinvara, Co. Galway. Guests can relax in spacious en-suite rooms, with wonderful views of Ireland's unique Burren region. We are a friendly, family run guest house, where personal attention is guaranteed. Bed and Breakfast cost from ?27 euro per person sharing, and from ?35 per person for single rooms. This includes full Irish Breakfast, with tea and coffee available at all times.